After a terrific dinner with the New Balance team on Friday night, I didn’t arrive back to my hotel room until after 11 p.m. Ryan met me there and the two of us ended up talking until close to 1 a.m.
Our decision to stay up until 1 a.m. wasn’t the smartest because when our alarm started blaring at 5 a.m., I wanted to chuck it across the hotel room and listen to it shatter into a million little pieces. Thankfully my disdain for our early morning wake up call didn’t last long. Though it was hard to feel motivated to get out of bed, once we got moving, the anticipation of a fun race ahead helped me feel excited and energetic in no time! Ryan and I headed down to the lobby of our hotel to meet up with the other 5K runners from our New Balance group at 5:20 a.m. It was a groggy bus ride to the start line of the race, but everyone was much chattier once we walked over to our corral. Unfortunately, our entire group was in corral D, the very last corral, which meant hundreds of runners and walkers started before us. Since it was already a crowded race to begin with, we had a feeling this particular 5K would be more of a run/walk race than an all-out run. 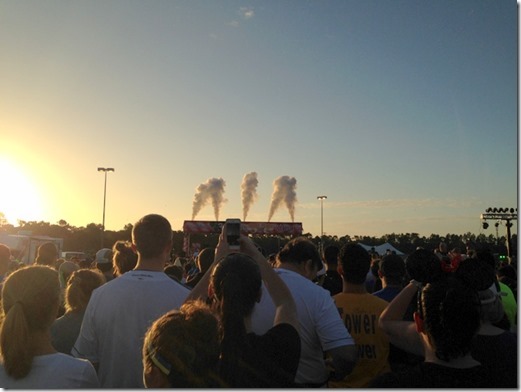 My blogging buddy and runDisney announcer, Carissa, warned me that the race was definitely not the race to try to run for a PR (personal record) and I was glad I knew to anticipate congestion otherwise I might have felt a little frustrated. Our group arrived about an hour before the start which may seem excessive, but I didn’t feel like we were waiting around for all that long. 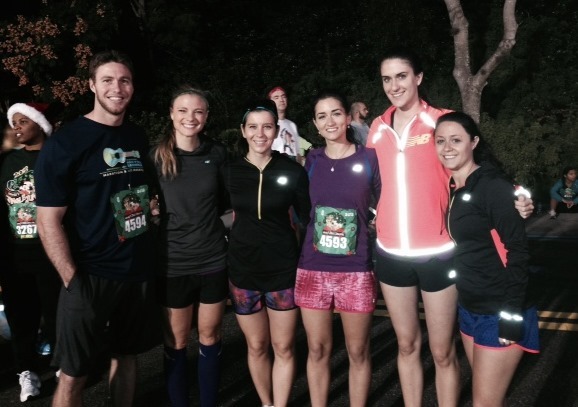 By the time we used the bathrooms and complimented some fellow racers on their awesome costumes, it was time to run! Since Tina and I attended the 5K thanks to the awesome folks at New Balance, we came to the race decked out in New Balance gear. I initially wore the Heidi Klum Moto Pullover, but ended up tying it around my waist once I started running. (This is the same pullover I wore to the expo, but in gray instead of coral. I saw it pop up on sale on HauteLook today for $30 cheaper if you are in the market for an extra long, comfortable and lightweight pullover!) I also wore the Impact 3-inch run short in black and raved to the New Balance team about the fabric and the fit of the shorts. I adore the wide waistband (it doesn’t dig into your sides) and the material is soft and doesn’t bunch up between your legs when you run. An all-around winner for me! 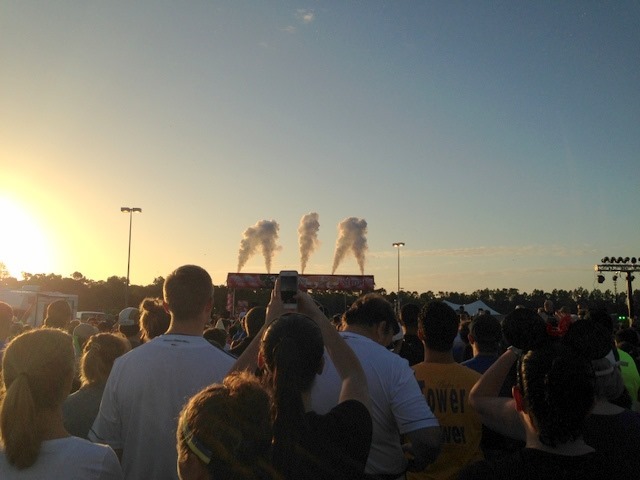 The race began promptly at 7 a.m. and our group started out together, but it was impossible to run side-by-side. 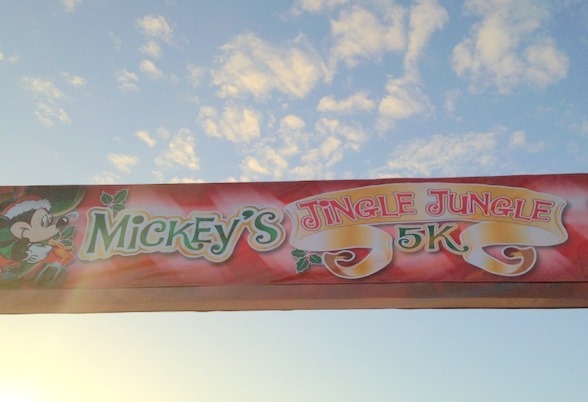 The race is called Mickey’s Jingle Jungle 5K because it’s a holiday-themed race that takes participants through Animal Kingdom. We reached the park after running for about a mile and I was so excited to see that holiday decorations were already in place. Since the park is not open to the public during the race, there are no spectators cheering you on as you run, but that didn’t matter at all because there were Disney characters there to pump you up! 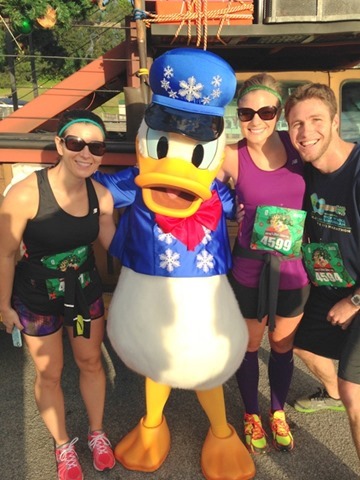 Many runners and walkers stopped to have their picture taken with a Disney character along the race and Tina, Ryan and I made sure to say hello to Donald Duck who was dressed in his holiday finest. 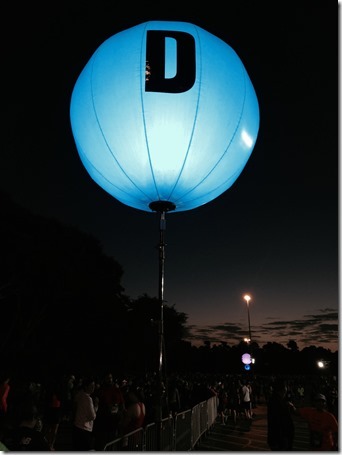 I was incredibly impressed with the efficiency of the photo opps along the course. If you wanted your picture taken with a character, you had to wait in line, but the lines moved very, very fast and they had a Disney cast member there to take your photo for you, which was so helpful and made everything run seamlessly. 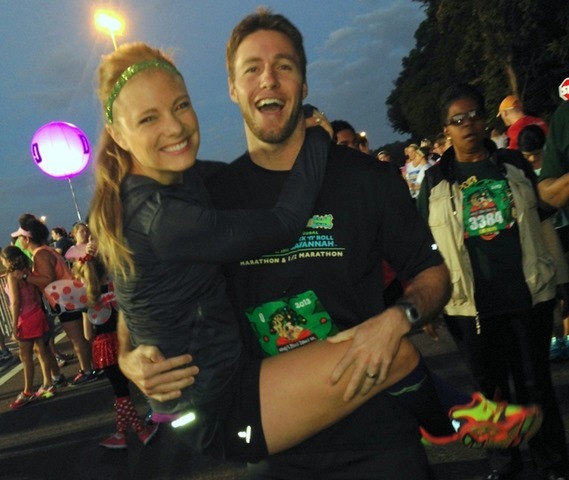 Plus, if you’re running with someone, it’s a great way to make sure you’re both in the picture! 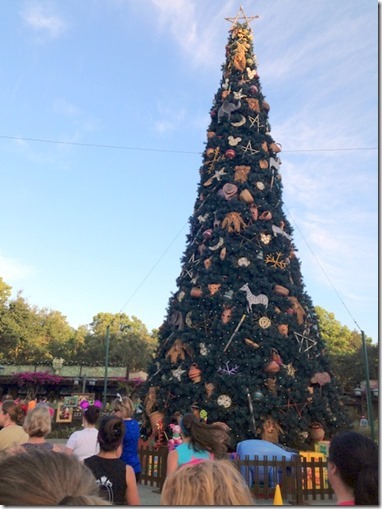 We ran along and had fun waving to the different Disney characters (I saw Rafiki, Baloo, Pluto, Chip and Dale and King Louie) and I loved it when I could hear holiday music blasting at various points along the course. 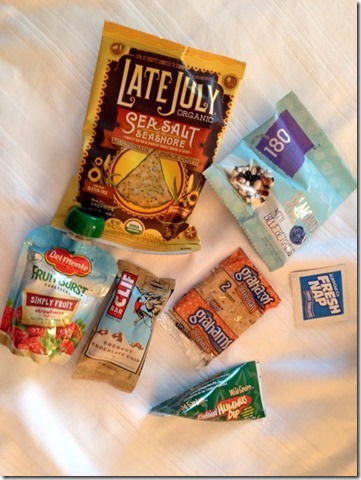 Tina, Ryan and I ended up crossing the finish line in 36 minutes and were immediately handed snack boxes full of goodies! 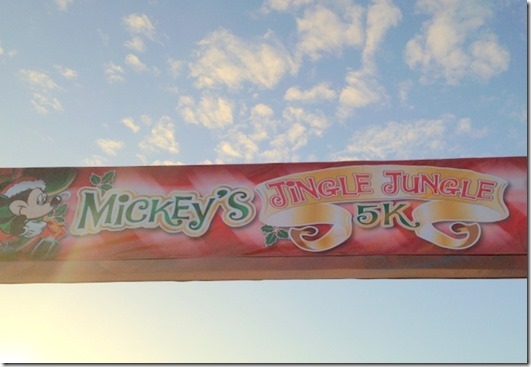 Mickey’s Jingle Jungle 5K was a blast and I would love to do it again! I’d definitely register earlier and put a lot more effort into coming up with a fun costume. We saw so many creative outfits along the course. I loved Cruella de Vil, Flora, Fauna and Merryweather from Sleeping Beauty, the Incredibles, Sebastian and more. 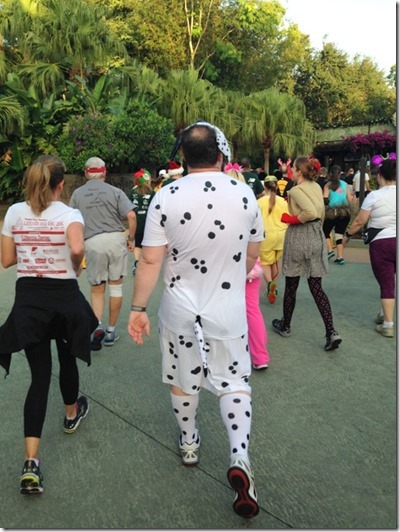 I will definitely be registering for another Disney race in the future because I already have way too many costume ideas that I need to debut! Please email me at pbfingers@gmail.com with your mailing address and your size preference and we’ll get you the opal tunic ASAP! Have you ever dressed up to run in a race? If you were going to dress up as one Disney character for a race, which character would you be? That looks like such an awesome race! 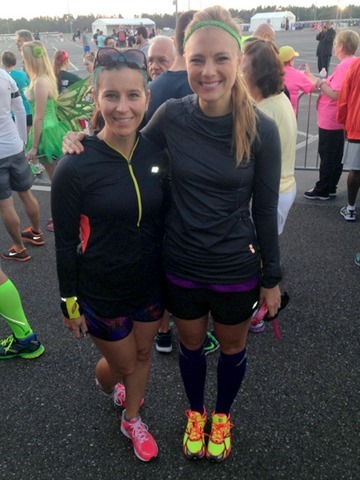 I’ve never dressed up for a race but it looks like a lot of fun! I looove your shoes too! 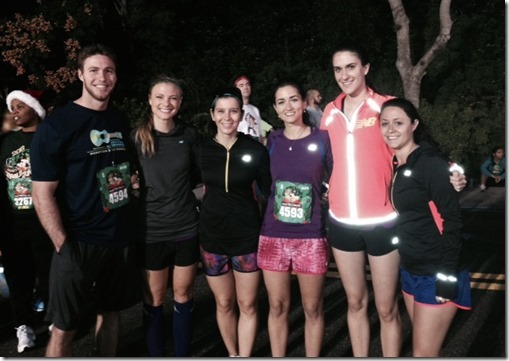 The Disney races are so dang fun! I just did my second half marathon this weekend and I talked my boyfriend into it (I’m pretty sure he was just in it for the food at the end) and we went as Minnie (with a red tutu and sequined ears) and Mickey. It was so fantastic!! I did the Princess Half Marathon last year and ran as snow white, and this year my mom and I are running it together so we’re already planning out costumes!! The Disney runs are fun and creative, but there is a lot of congestion indeed (and my runkeeper app tracked my run at just under 14 miles from the dogging other people and weaving in and out). But if you’re a Disney enthusiast, you can’t get better than running through the parks and behind the scenes without the general public around! I ran the Wine and Dine Half Marathon this weekend..I had the same problem with the volume of runners and got stuck in a bunch of traffic jams! Especially through Animal Kingdom. 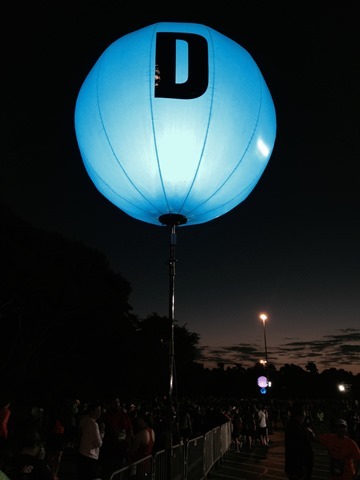 Hope ya’ll had fun! I hope you threw most of that snack junk away! Thank you for mentioning the awesome grey hoodie at hautelook, just bought myself a little early pressie. I’m so glad you guys had a good time and 36 minutes it great with the stops and crowd. I think I actually did PR, but I don’t know for sure since it was a fun run, but MR. Garmin said I did a darn good job! I’m running the Tinkerbell 1/2 marathon at disneyland in January. I’m dressing up as Snow White for the race. It’s my first disney race and I’m super excited!